Respect and protect the inherent land and territorial rights of Indigenous Peoples, as set out in ILO Convention 169 and the UN Declaration on the Rights of Indigenous Peoples [UNDRIP], including by recognizing that respect for indigenous knowledge and cultures contributes to sustainable and equitable development and proper management of the environment. 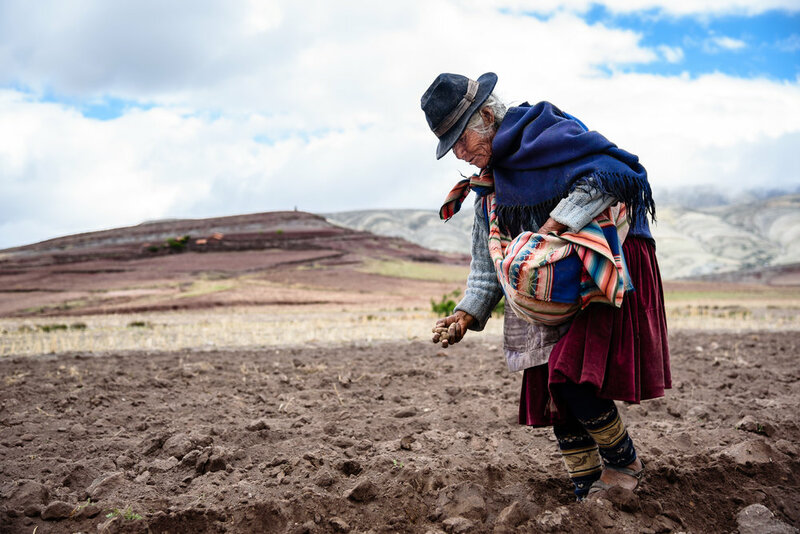 Globally, the ILC Secretariat has been using the UN Permanent Forum on Indigenous Issues (UNFPII) and Slow Food Terra Madre as opportunities to advance collaboration towards the implementation of UNDRIP. Every year ILC has supported members to come together in side events at the UNFPII, including on indigenous and community land rights (the Land Rights Now campaign) and indigenous youth. In 2016 ILC, together with FAO and IFAD, co-chaired the Inter-Agency Support Group (IASG) of the UN Permanent Forum on Indigenous Issues. The Annual Meeting took place in Rome with around 40 representatives from various UN agencies, providing an opportunity to position indigenous land rights within wider UN processes and to identify possible cooperation in NES countries. As a result, a working group on national policy dialogues was created, and ILC members IFAD, International Work Group for Indigenous Affairs (IWGIA), Centro para la Autonomía y Desarrollo de los Pueblos Indígenas (CADPI) and Forest Peoples Programme (FPP) are currently coordinating support for national dialogues in Ecuador and Nepal for UNDRIP implementation. In Asia, the initiative “Advancing the recognition of Indigenous Peoples’ land rights through evidence-based advocacy” coordinated by Asia Indigenous Peoples Pact (based in Thailand) and involving four other members from Cambodia, Indonesia, Nepal and the Philippines, has focused on developing members’ capacities in participatory mapping, monitoring and documentation with the ambition of region-wide monitoring of IPs’ lands, as well as supporting their campaign work in Thailand and Myanmar for the passage of laws recognising customary lands. At the global level, the CBI has supported the Indigenous Peoples Major Group for Sustainable Development in its advocacy on the SDGs and has contributed to the Land Rights Now campaign. In Africa, the CBI “ILC Action Plan for Indigenous Peoples’ Land Rights in Africa”, coordinated by Ogiek Peoples’ Development Program (OPDP) and involving eight members in Kenya, Burundi, Tanzania, Cameroon, South Africa, DR Congo and South Sudan, and a network extending to 12 countries, is working to build a solidarity movement of IPs across the region and to build the capacities of their organisations to advocate for rights at national and regional levels and to influence policy-makers. The CBI also documents best practices and lessons learned. In 2017, more than 50 IP representatives from Africa participated in a learning exchange on Access to Benefit-Sharing. In Latin America and the Caribbean, the initiative “Land and Territorial Rights of Indigenous Peoples and Afro-descendants”, coordinated by CADPI and involving 20 members from seven countries, documents land, territory and natural resource rights violations, promotes legal safeguards and advocates for rights at national and regional levels. In its first year, it organised a regional training on 3D participatory mapping and two regional courses for capacity development on land tenure and governance and VGGT use and implementation. Having exhausted local redress mechanisms in their fight for their rights to land, religion and culture, the Ogiek community brought a land rights case against the Kenyan government at the African Court on Human and Peoples’ Rights in 2017. The case drew the attention of the international community and helped hold the government to a higher standard of accountability. It enabled the Ogiek people to address violations of their rights to human dignity, worship, education, property and association, among others. During the case, the OPDP documented community by-laws, maps and protocols for the management of communal lands, and used this information to engage the government in seeking legal ownership of the land. The court ruled in favour of the Ogiek, recognising them as an indigenous community and restoring their land rights. The community of 45,000 people has now designated 26 May as Ogiek Celebration Day to commemorate the landmark ruling. Critical to the success of the process was the integrity of the lawyers who stood firm against intimidation and attempts at corruption. Some witnesses and OPDP members received threats from unknown people, but these were handled by security provided by Human Rights Defenders. This established a deeper link between OPDP and the National Coalition of Human Rights Defenders.